WESTBURY, NY--(Marketwired - December 08, 2015) - Nondestructive testing is utilized in everyday applications. Dependable light sources are necessary to examine the structural integrity, safety and reliability in aircraft, pipelines, bridges, trains, platforms, buildings and much more. 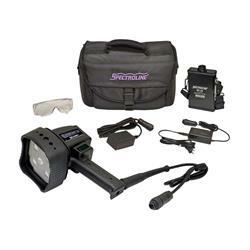 Spectronics Corporation manufactures a wide variety of lamps to meet this need. 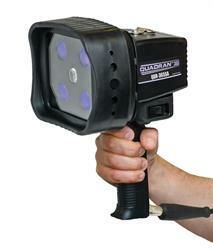 Spectroline® QUADRAN™ 365 S-Series are powerful, multi-LED, broad-beam UV-A (365 nm) inspection lamps. They are specially designed to meet ASTM UV-A intensity and wavelength specifications for FPT and MPT. They're engineered with four ultra-hi-flux UV-A LEDs for fluorescent inspection, plus a white light LED for flaw location. Their broad-beam configuration produces an extremely wide coverage area of up to 5 inches (13 cm), with a minimum UV-A intensity of 2,000 µW/cm² at 15 inches (38 cm). The lamps can be hand-held or used for in-line inspections. The QUADRAN 365 S-Series NDT inspection lamps are available in two models, QDR-365SA and QDR-365SBLA. To address aerospace industry concerns, both units are "tuned" to a maximum UV-A intensity of 4,500 µW/cm² at 15 inches (38 cm). The QDR-365SA comes with a standard faceplate and the QDR-365SBLA comes with a faceplate containing integral black light filters that further reduce the emission of wavelengths longer than 400 nm. Both models have a high/low switch to control the white light LED output. The white light LED's high-intensity setting is 300 foot-candles (3,229 lux) and the low setting is 10 foot-candles (108 lux). A certificate of compliance for both wavelength and output measurements is supplied with each lamp. Also available are the QUADRAN 365 MS-Series portable, battery-operated AC/DC lamp kits. Along with the QUADRAN 365 S-Series UV lamp, the kits contain a rechargeable NiMH battery pack, AC and DC cord sets, a smart AC charger and UV-absorbing glasses. All components are packed in a soft, lightweight carrying case. Headquartered in Westbury, New York, Spectronics Corporation invented fluorescent leak detection in 1955, and remains the world's leading manufacturer of ultraviolet equipment and fluorescent dyes. Spectroline® cutting-edge, top-quality, industry-awarded lamps, dyes, radiometers and diagnostic tools are built to exacting standards, and are used for literally dozens of markets, some of which include Industrial, Air Conditioning & Refrigeration, Laboratory, Semiconductor, Nondestructive Testing and Forensics. Spectronics Corporation is dedicated to upholding high standards in design manufacturing, ensuring customer satisfaction and developing innovative technologies that make the world a better place. For more information, call toll-free 1-800-274-8888. Outside the U.S. and Canada, call 516-333-4840. Website at www.spectroline.com.